"Branches" (1976) starts with a performance of "Child of Tree" and is then followed by a random number of variations on Child of Tree each of it lasting 8 minutes, all of which are separated from each other by periods of silence, lasting 1-8 minutes. Find 10 "instruments", one of which is a pod (rattle) from a poinciana tree. These grow in Mexico (e.g. in Guernavaca). Each player decides on the course of his score of Branches by means of the I Ching. It is used to determine the arrangement of Child of Tree and its variations, the number of instruments that are played in a particular part, the choice of instruments (the pod is always reserved for the last part, the others may occur in groups, but only once each) and the length of the rests. For this piece, you should use neither conventionally tuned instruments nor any that are made from animal materials or metal. Especially recommended are cacti (alive or dry) whose needles are plucked by using toothpicks. John Cage gave directions for improvisation, "because the improvisation can’t be based on taste and memory since one doesn’t know the instruments"(John Cage in an interview, 1982). For this recording, we chose a room in which the usual criteria like neutrality of sound, clear early reflections and high diffusion were not necessarily the predominant features. The recording took place in the colossal dam in Val Sumvitg (Grisons, Switzerland), excluding any sounds from outside, and at a constant temperature of 6° C. The inner space of this concrete building is divided into 7 chambers of varying size, which are up to 20 meters high or ca. 1000 m³ in volume. Connected by two corridors, they form a system of acoustically coupled spaces. Microphones and speakers were arranged to reach different response times from very present with quick early reflections to far away with long echoes. "daswirdas" is a group of seven musicians who perform experimental and conceptual concerts and do performances. Up to now the emphasis has been on works by John Cage, Urs Peter Schneider, Christian Wolff and Istvàn Zelenka. "daswirdas" consists of 2 guitarists, 2 cellists, 2 flutists and an accordionist. 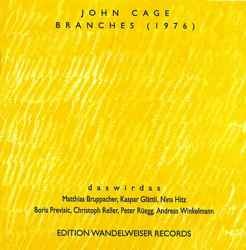 When the ensemble first performed Branches on May 12th, 1991 in Zurich, John Cage was present as a listener.